With a couple of days left for the official declaration of 2013 Kerala SSLC Results, the education department ready with wide facilities to reach the results to the students much faster. 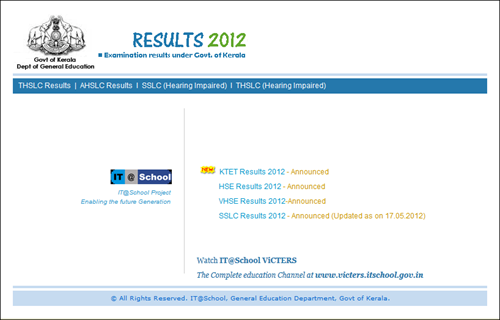 For those students who are waiting for Kerala SSLC results, various websites are well set to provide it within a click. Students can visit the official websites after the results get published on 24th April 2013. This year 4, 79,650 students had appeared for the exam. With thousands of teachers employed in 50 centres spread across 3 zones had finishing the tabulation process in record time of the exam which began on 11th March was concluded on 23rd March 2013. In 2012 the results were published on 28th April with 93.6% students obtaining opportunity for higher studies. The papers after tabulation process which was kept safe in the Pareeksha Bhavan will be handed over to the education department which will reveal the results on 24th April 2013. As the 10th board exam is the stepping stone for the future, students has done much preparation. As per the Indian system of education, the essentials consist of five years of primary schooling which is followed by five years of secondary schooling. The Secondary School Leaving Certificate which is commonly referred to as SSLC is a official recognition given to a student for his/her successful completion of the examination. After finishing SSLC, students will have to take the 2 years Pre-University Course (PUC) course which eventually bring close to the twelve-year period of study. For his/her undergraduate studies, students can choose a university or take up a short term diploma course. As the performance in the SSLC examination is an important factor in obtaining admission to HSS, students give much priority to the course.